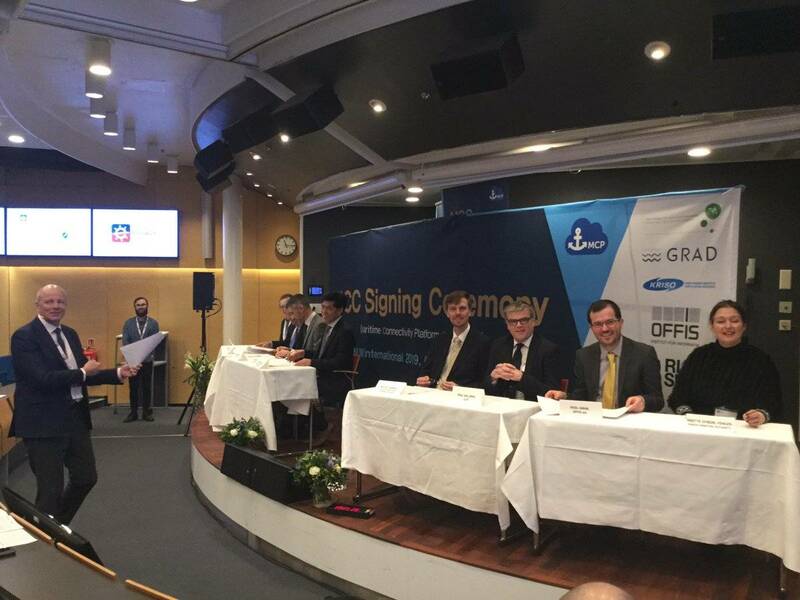 On February 8, 2019, the Maritime Connectivity Platform Consortium (MCC) was established with a signature ceremony during the conference ‘e-navigation underway international 2019’. The MCP, has been evolving for a number of years. Around 2015, the development escalated significantly, when three large projects collaborated on the common use and further development of the technology. These were the EU projects ‘EfficienSea2’ and ‘STM Validation project’ and ‘SMART Navigation project’ funded by the Korean government. During these projects an MCP testbed was established, which now has been running for several years, and nearly 100 organisations have signed up to the platform. The MCP itself initially addresses the goals of the e-navigation initiative of IMO, but the ambition is for the MCP to support digitalization in the Maritime domain at large. For this, the MCC is established as neutral and independent consortium of interested parties. It will act as the coordinator for the provision of guidelines and standards. The MCC adopts the open structure of the World Wide Web Consortium (W3C) and interested parties are encouraged to join these initiatives and bring in their visions and competencies. General Lighthouse Authorities of UK and Ireland. The Danish Maritime Authority (DMA), Swedish Maritime Administration (SMA) and the Ministry of Ocean and Fisheries of the Republic of Korea (MOF) are joining as Governmental Observers. SMA and MOF expressed that “The MCP could become an important framework for digitalization of maritime sectors, for instance, e-navigation, SMART shipping & maritime logistics, Sea Traffic Management (STM) and MASS (Maritime Autonomous Surface Ship)” with one voice.